The hybrid drinks category has expanded as Irish cider brand Magners launches what it claims is a “spirit cider”, containing Irish whiskey. 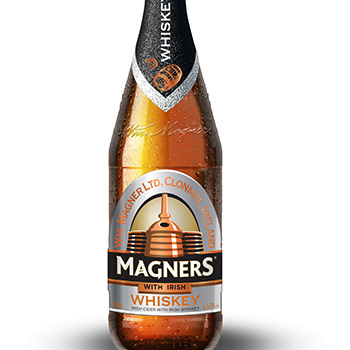 Magners with Irish Whiskey contains 25ml of Irish whiskey in a 500ml bottle of traditional Magners apple cider. The whiskey was created by West Cork Distillers. The cider brand claims that spirit cider hybrids, dubbed “spiders”, have been a feature in the UK on-trade for a number of years. “Magners has been at the forefront of cider innovations since it revolutionised the cider category in the nineties with its over-ice serve, and today we are introducing another game changer, Magners with Irish Whiskey,” said Ed Shoebridge, head of customer marketing at C&C Group, producer of Magners. Bottled at 5.5% abv, the variant will be available in Asda stores across the UK from 5 February. In October 2013, Tennessee whiskey brand Jack Daniel’s launched Winter Jack – a blend of whiskey, winter spices and apple cider liqueur.